America’s gun lobby says private ownership of firearms prevents tyranny. That’s why the Founding Fathers guaranteed the right to bear arms in the Second Amendment. The first part of that argument makes little sense and is easily put aside. I think the second part is wrong too. The Second Amendment wasn’t meant to guarantee the right to bear arms (however it’s used today). But understanding why requires a bit of history and a bit of thought. What about the other argument: the Second Amendment right to bear arms? Well, the Second Amendment doesn’t say everyone has the right to own a gun. It says, “A well regulated militia being necessary to the security of a free state, the right of the people to keep and bear arms shall not be infringed” (italics added). In other words, it starts with an explanation for gun rights. It’s actually the Constitution’s only clause with an explanation. Why? 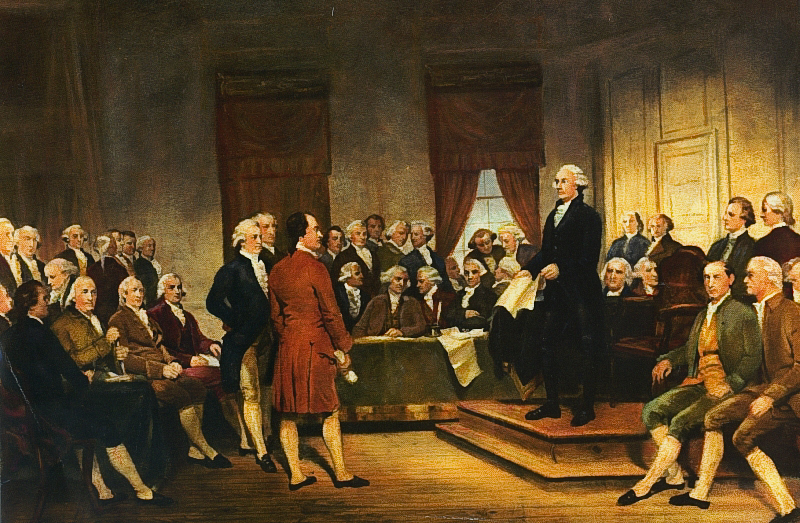 The Constitutional Convention, 1787. Many of these Founding Fathers went on to join the First Congress, which wrote the Bill of Rights in 1789 — including the Second Amendment. If the Founding Fathers meant to give us unlimited and universal gun rights, the Second Amendment wouldn’t need an explanation. It would just read, “The right of the people to keep and bear arms shall not be infringed.” Instead, the Founders explained the purpose for gun rights — national security — to suggest that those rights only apply where they serve that purpose. The Amendment only protects potential militia-members’ rights to bear arms, and only to the extent that America needs militias for national security. The Second Amendment’s explanation tells us that gun rights were meant to apply only to the extent that they support a “well regulated militia” “necessary to the security of a free state.” That was an easy qualification for the Founding Fathers because it wouldn’t restrict gun rights much in their time, if at all. It’s possible they didn’t even give it much thought, which would explain the lack of records on the Amendment’s meaning. In Eighteenth Century America, a militia was, literally, a bunch of average Joseph’s who owned flintlock rifles. Almost any free man could join. Militias of these men had played a vital role in the War for Independence, and they could be counted on to defend the new nation. So even as qualified, the Second Amendment protected gun rights for just about every free man. Today, however, a bunch of average Joe’s with guns might, at best, form a scattered guerrilla movement, not a “well regulated militia.” So the portion of gun owners falling outside the Second Amendment’s protection has soared from almost none to almost all. In other words, the landscape has changed, and the Second Amendment, by its own terms, should offer almost no protection to modern gun ownership. Unfortunately, today’s conservative Supreme Court doesn’t agree. But here I’m talking about the amendment as history — its role intended by the Founders — not the courts’ current interpretation. How, then, would the Second Amendment work if it were enforced according to the Founding Fathers’ intent? It’s possible some American states could point to a few individuals who play a role in their National Guards, thanks to personal ownership of guns. If so, the states could protect those people’s guns from federal interference. And if a modern state created a militia made up of average Joe’s with their own weapons brought from home, it could use the Second Amendment to protect all their able-bodied citizens’ guns. But that citizen army would have to be real. The state would have to spend millions organizing and training this “well regulated militia,” or forfeit any argument that it’s relevant to modern warfare — that it’s “necessary to the security of a free state.” As of today, no state has such a force, so the Second Amendment should give almost no one the right to own a gun. In other words, the Constitution wasn’t meant to impose today’s insanity of assault rifles and handguns on America. The Founding Fathers crafted a flexible amendment on firearms, giving our legislatures the freedom to craft a sensible gun policy. © 2013, 2015 by David W. Tollen. I see that you drank many Pints before making up this false history. if everyone in america played D&D we would all arm up with Lord of the ring replica blades and get out our flintlocks but no there is an underground market & if the US makes any law it has no effect especially with guns coming illegally through mexico which means law abiding gun owners will not touch which only leaves the criminal elements. If market supply is not met other borders will be retrofitted for the demand. mayb we need to start making all Law Abiding Citizens Armed & Aware just to even out the playing field of Crook vs Civi. if something plays out in some city or community their will people that will quell the problem before the solution(cops/officers/swat.etc..) arrives which is when innocent people are usually already dead w/ the media already displaying bodies. it would be nice for every problem their would or could be an instant justifiable action. Criminals & Soldiers are not the only people that should have weapons training or we leave out a big demographic that creates the homeland.